A letter from the Indologist W. Norman Brown to Har Dayal dated December 14, 1938. 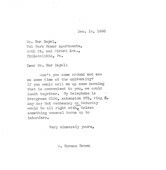 In the letter, Brown invites Dayal for a meeting at the University of Pennsylvania. A letter from Har Dayal to Indologist W. Norman Brown at the University of Pennsylvania. Dayal describes his acquaintances from various U.S. institutions, and indicates that he plans to visit Philadelphia for the Summer. Dayal also mentions his permanent residency in the U.K., although his letterhead has a Philadelphia address.